Case cooling is becoming more essential these days. The better airflow inside your system, the cooler and more stable system you will get. The COOLER MASTER R4-L2S-122B-GP comes with two fans offering economic solution for perfect performance. High Performance The COOLER MASTER R4-L2S-122B-GP delivers generous 39.77 CFM of air flow to efficiently and effectively dissipate the heat inside the chassis. Silent Operation This case fan runs at 1200 R.P.M. + / - 10% and produces neglectable 19 dB-A noise level bringing peace of mind to you and your co-workers. Blue LED The 4 blue LEDs radiate mystic blue light through the higher transparency fan frame creating an immersive ambience for eye-catching fun. This item is covered by Raitver Return Policy. Cons: DOA 1 fan came dead although the light did work, tried using DOA Fan on fan that worked power supply and sadly nothing but the light. Other Thoughts: -Only a pro or a con depending on what you want, but these fans are insanely bright. My case came with LED fans and I expected these to have a similar brightness level. These two fans are so bright they completely light up my dark room. 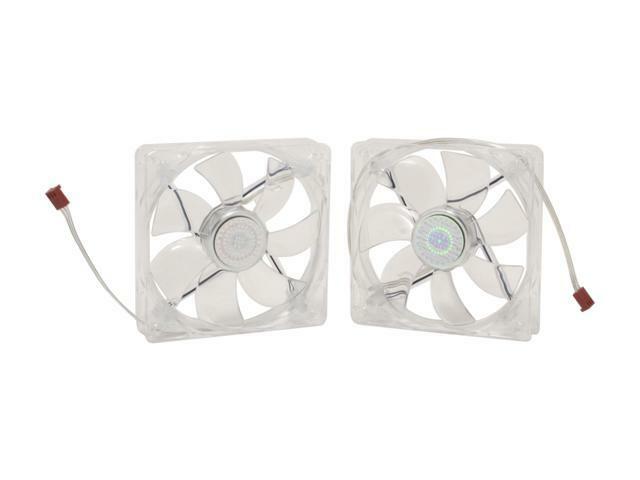 I would not use these fans on a case that will be running in a bedroom. -These fans are also extremely loud in my case. After some research I have discovered that this is due to the shape of my fan grates (honeycomb). When positioned as intake fans, they are unbearably loud. As vent fans, they are silent. I am purchasing some filters to hopefully cut down on the noise and maybe even the brightness. Neither of these issues is really a fault of the fans though. Pros: Silent Fans, easy to install, and I love the Blue LED at a good price point when I bought them. Cons: No cons so far will update if there is an issue with the over all life of the fans. Other Thoughts: I recommend these Fans If anyone is in need of a few extra case fans these will do the trick. Pros: Ordered these back in 2013 and had them at the top of my case ever since. They're still running great and not too noisy. The length of the cables make them nice to reach the farther fan pins on the motherboard. There's not much to say about the LED. It's bright and will shine through the clear body of the fan, though probably not bright enough to light up your whole case. Great power indicator, if nothing else. Cons: Not much more you can ask for at $3.50 USD a piece. Pros: I have 4 of these installed in 2 HAF 912 cases. They're great little fans, and even with sleeve bearings, they're quiet and move a decent amount of air. The blue LEDs really set the cases off. My oldest case is 4 years old, and the fans in that one still run like new. Nice and quiet. None of the regular screws that even came with them fit into the fan all the way. Had to use my own random screws, otherwise they get loud and rattle. Pros: - Easy install, no problems, fit well. - Blue light looks nice. - Price is good, especially on sale. Cons: - Not very silent. If your doing nothing you can easily hear it, however, if your actively engaging in conversation or gaming you can easily tone it out. Other Thoughts: Honestly if I could go back I would buy something a little more expensive for a more silent sound but that's just me.